Check out the following images and prepare to laugh out loud! It looks like James took the request to ‘add some features’ quite literally here! 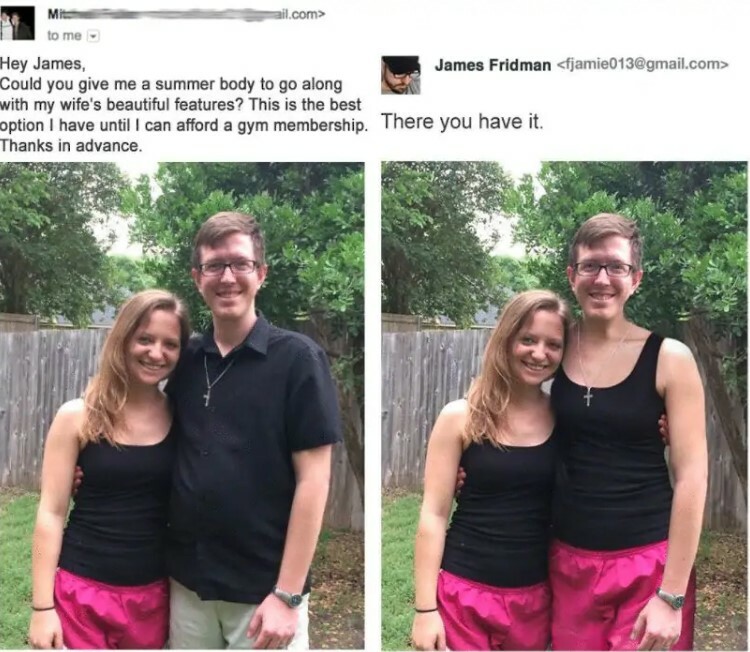 When this person wanted him to get rid of the dad bod and make him equally fit to his wife, he probably expected a different result. However, the Photoshop master was determined to fulfill the request in his own typical style! You can tell that he succeeded in making them look alike. In fact, he made their bodies and outfits equal! It seems that Fridman is more than sarcastic sometimes. This request is the perfect example! As you can see, these girls were striking a pose next to their much shorter friend. 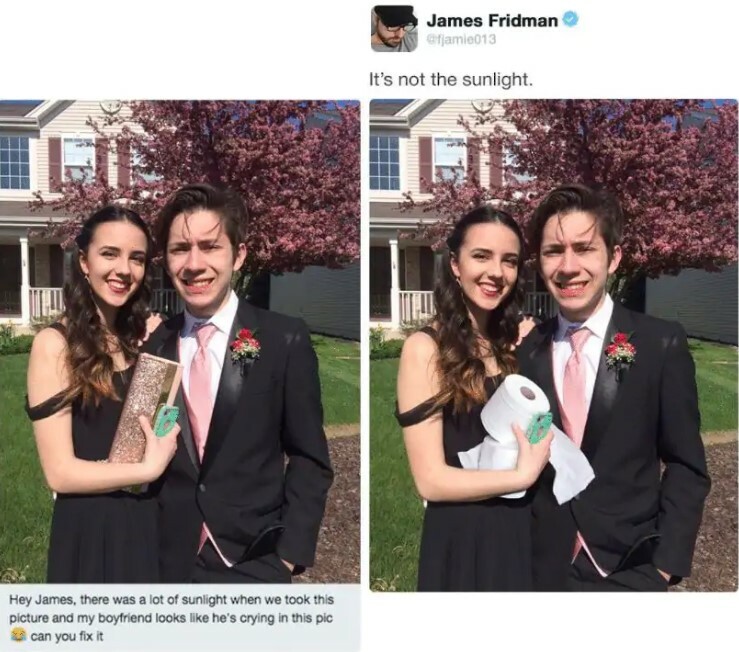 Instead of altering the photo in some other hilarious way, James decided to show them what they could have done in the first place. 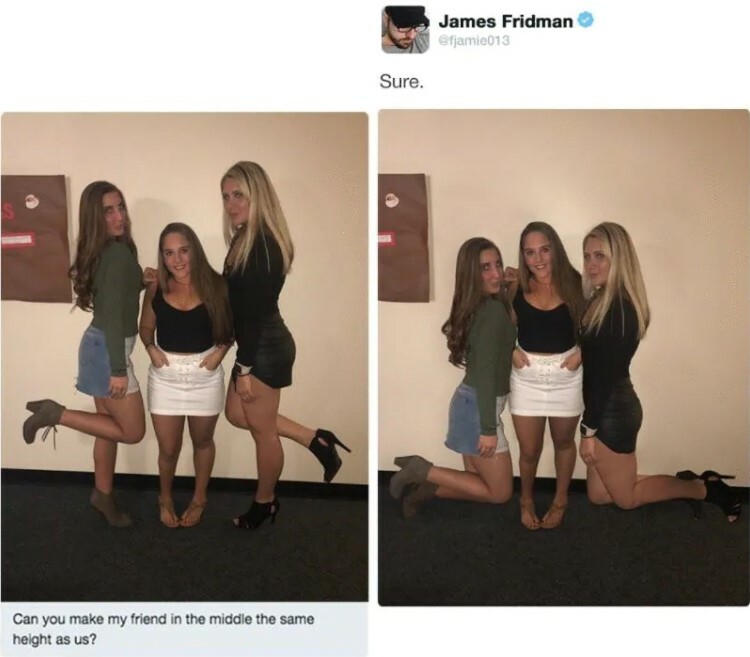 We guess that if they wanted their friend to feel equal, they would have kneeled in the original photo. 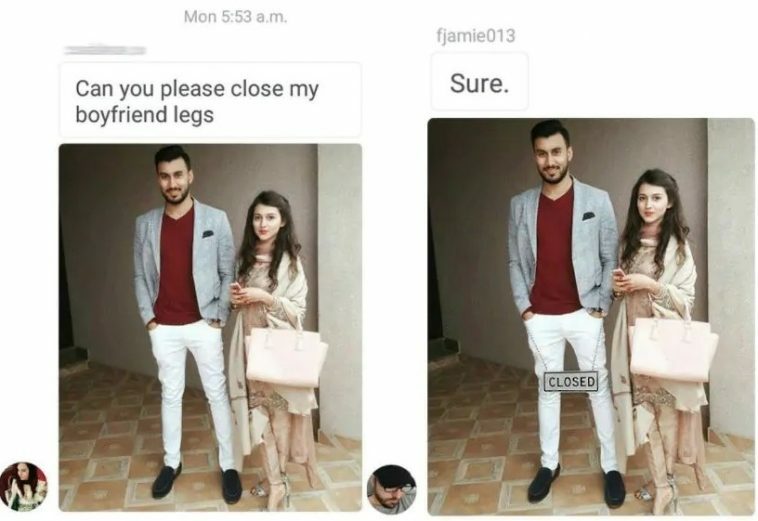 This girl had a rather strange request. 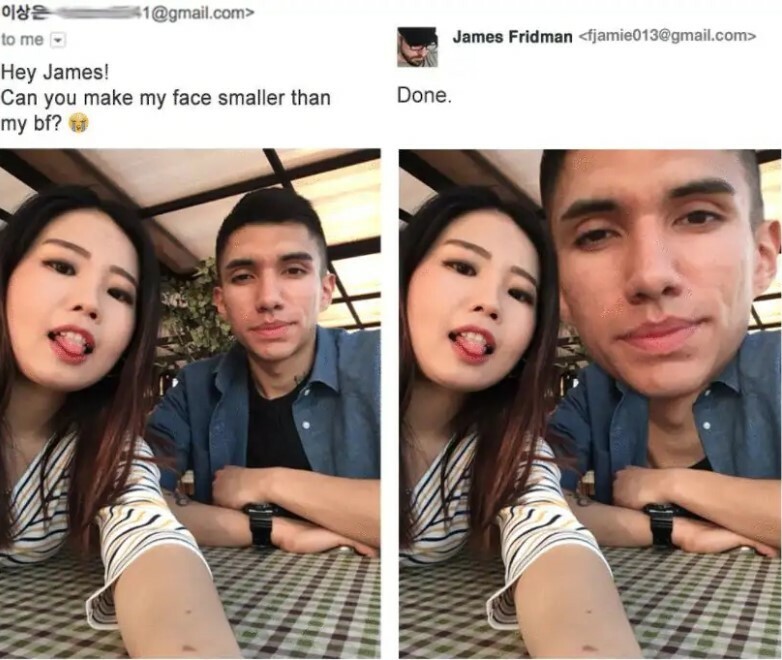 Her head is not bigger than her boyfriend’s. The angle of the picture makes it appear this way. However, it seems that she was determined to make it right, so she asked James to fix. And he did just that – he fixed the photo and fulfilled the request. Of course, this was done in a typical Fridman-style, but technically speaking, the girl’s head is smaller now. This means the job was done. We have always considered these requests to be strange. When you are in a public place and you take photo, it would be normal to have other people in the background. If are in the middle of a crowd, this would be certain! However, this couple was not happy with the smiling person behind them, and they wanted to get rid of his image. James was able to deliver once again! He did it in the best possible way, with a lot of sarcasm sprinkled on top! Here is an example of fine trolling! This girl already looked pretty, but she wanted to look absolutely perfect! 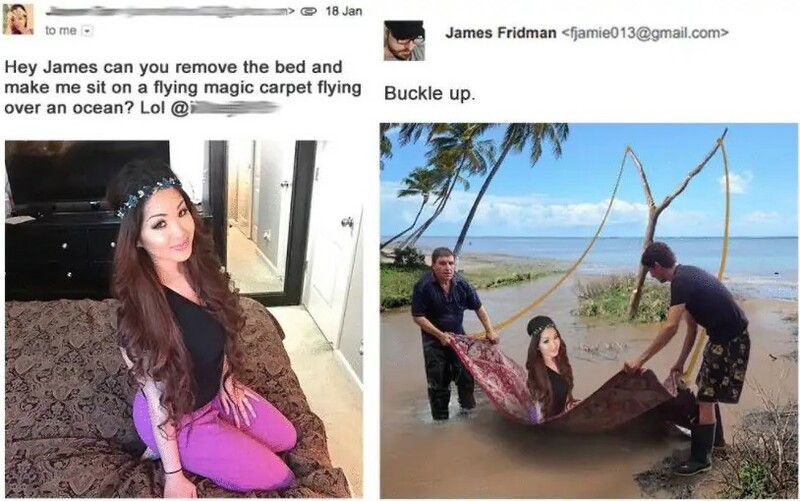 James probably wanted to work on the photo, but he chose to teach her a lesson. We can say that his reply is admirable. 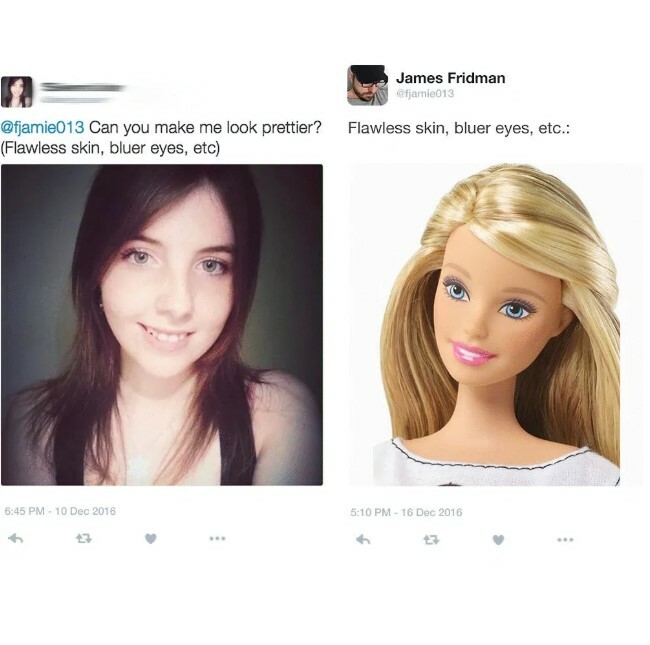 He posted a photo of Barbie because he wanted to say that everyone is beautiful. Perfection can be found in a doll’s face, but beauty is all around us. When you ask someone to alter your photo, you need to be specific about it. These people probably imagined something else when they asked James to tweak their photo. He is always able to respond to that request, but he does things from a different point of view. As you can see, these people’s request was fulfilled, but we are sure they were puzzled by the end result. As you can see here, the possibilities of Photoshop are endless! 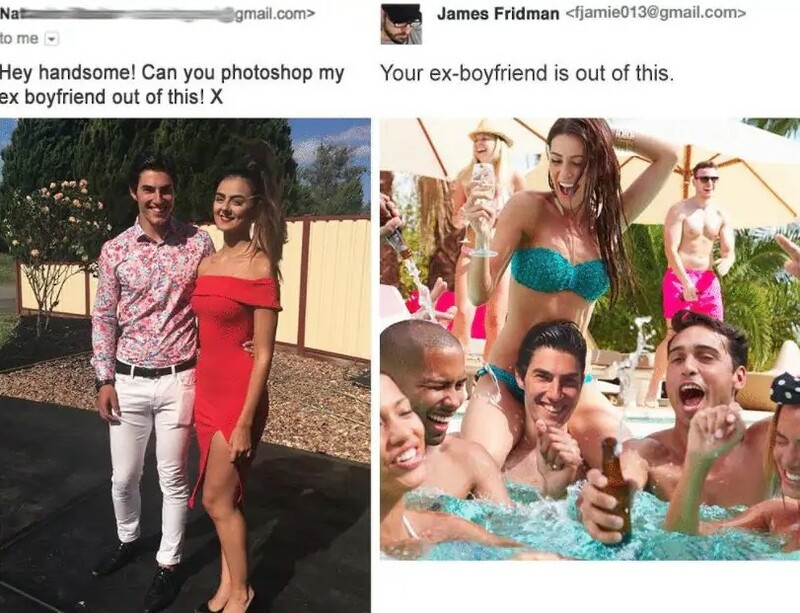 James Fridman can surely take you on a journey back in time. We are glad that he received this task, because we get to see the result. 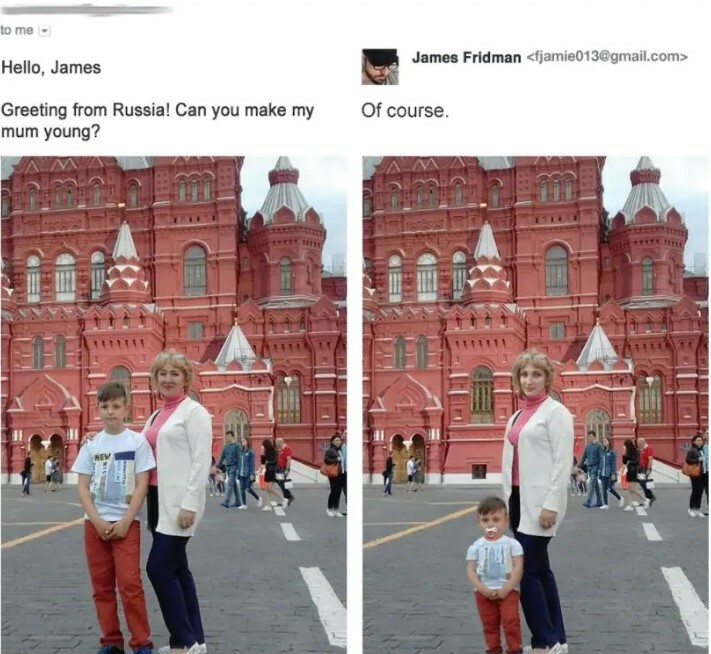 The boy from the photo asked James to make his mom appear younger. The talented digital artist was more than happy to deliver! He decided to make the photo period correct, so he made the boy younger, too. We love the way he altered this image! People really need to have a second look decide whether their photos really need some kind of editing. This is a nice example and we agree with the way James responded. The photo is perfectly good as an original. The fact that one of the people stares at the couple is okay, because you cannot control the crowd. 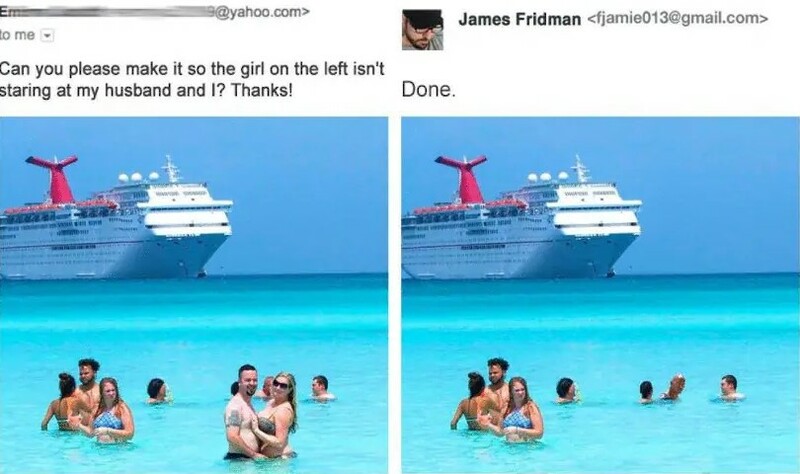 The couple needs to focus on the good memories about the crystal clear waters and the sun instead of worrying about someone in their photo. We like the way James tries to teach people a valuable lesson and we hope they get the message. We guess that some of them would fail to understand what he tried to say by editing their photos in a funny way. Take this one, for example. 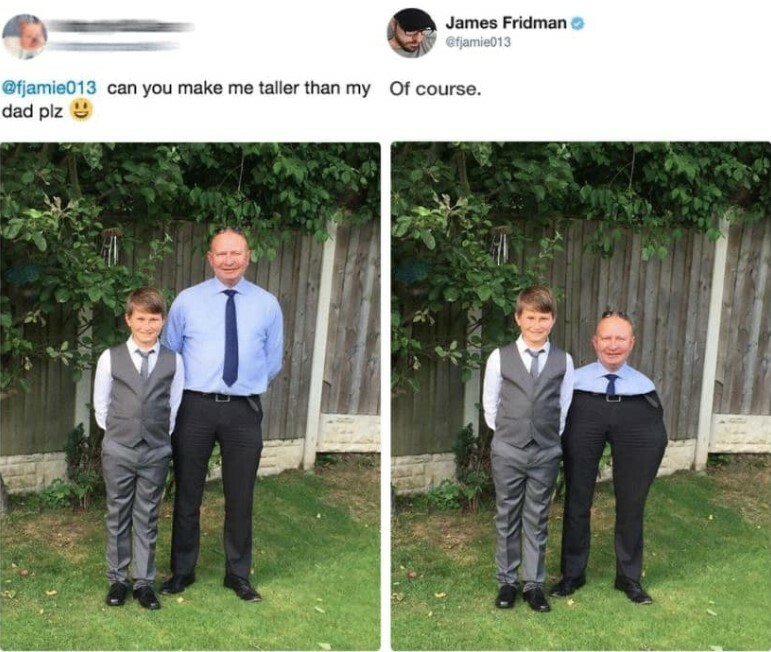 This kid wanted to be taller than his dad, but it seems that it was way too early for that. This was exactly what James implied when he edited the photo the way he did. If you want to feel like a princess, you need to make a better effort than asking someone to edit your photos. This person probably liked the way she looked, but the surroundings were not good enough for her. 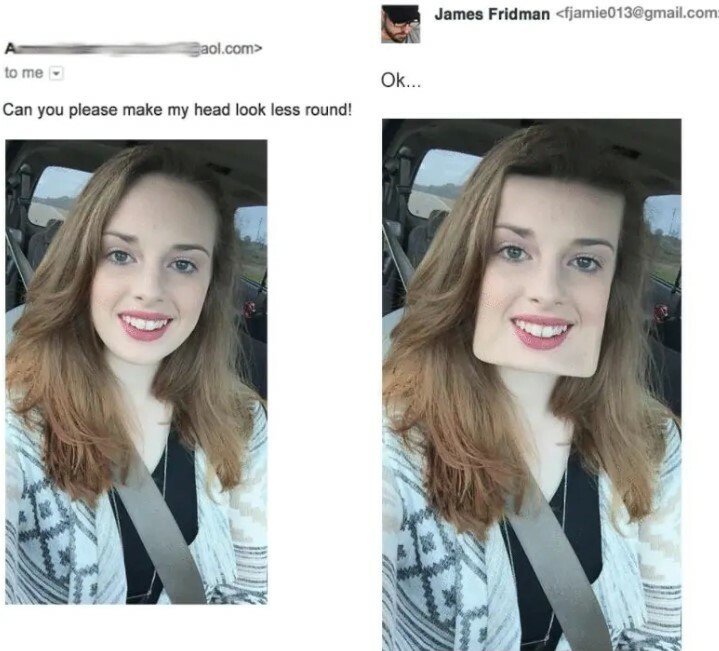 She asked James to change her photo in a very specific way and probably hoped to get exactly what she wanted. 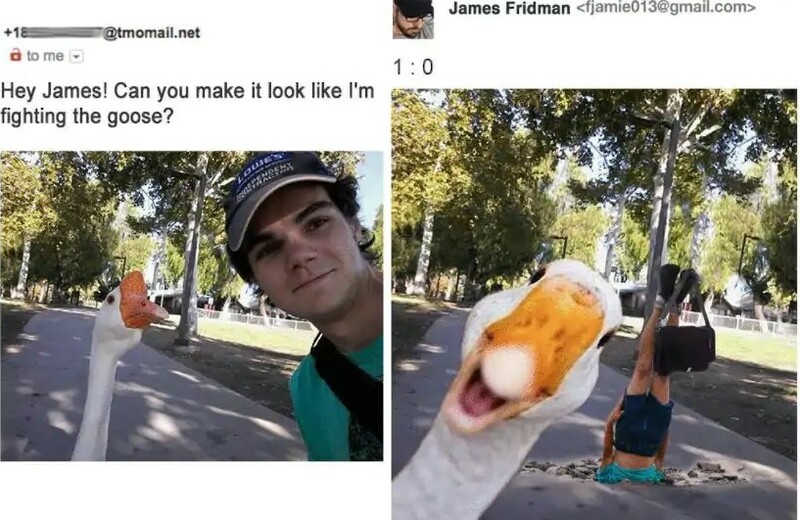 However, James was able to completely change the photo in the most hilarious way possible. This must be one of his best works yet. 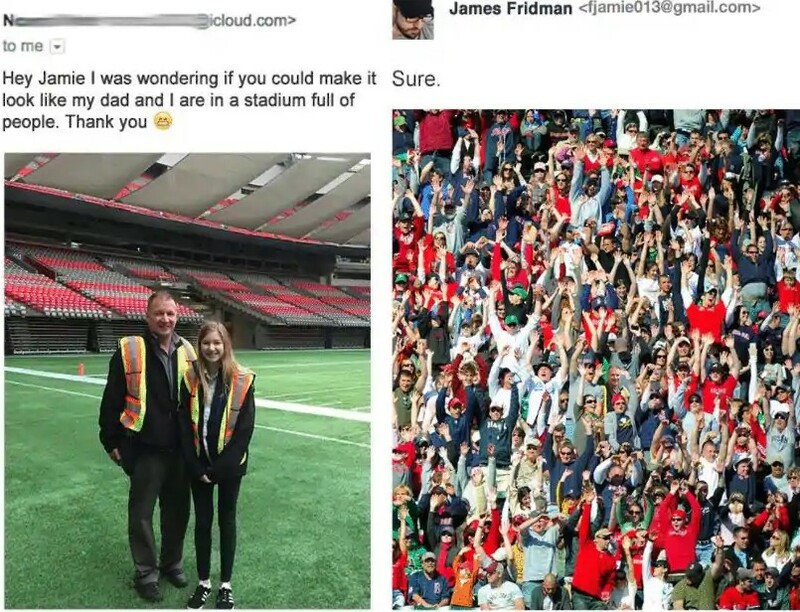 This photo shows why James is more than just a Photoshop master. His unique ability to combine skills and sarcasm is what makes his work amazing. Nobody could do the things he does, and we are sure he knows it. 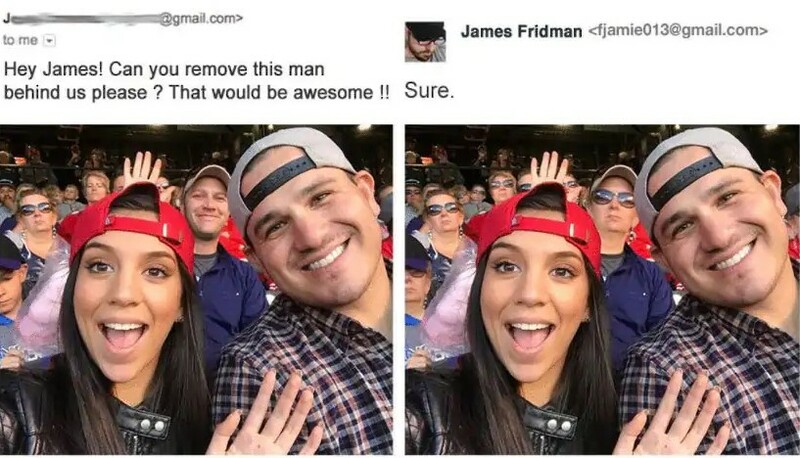 When this woman wanted her ex-boyfriend out of this photo, he probably thought that he should send her a message. We are sure she got it immediately! We also hope that the ex-boyfriend saw it, too. If you are familiar with Fridman’s work, you should be aware of his ability to respond to requests in an unexpected way. However, this person probably relied on that fact and hoped to receive a real fight scene. 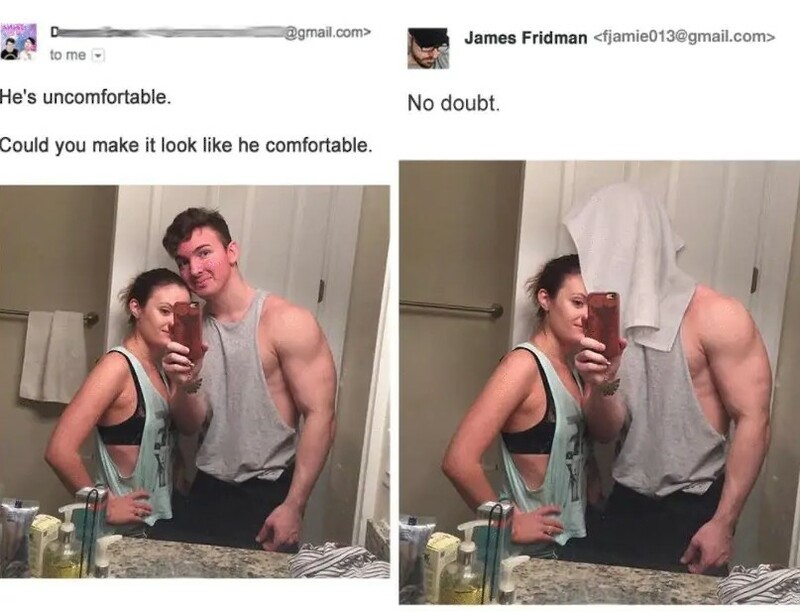 Unfortunately James pictured the whole thing differently. As you would expect, the end result is amazing, and we laughed out loud when we saw it for the first time! Sometimes the unusual part of Fridman’s work is not the way he responds to people’s requests. As you can see, these requests can be really odd sometimes. We agree that the person on the right looks a bit uncomfortable, but it is quite normal to be like that. However, the other person in the photo wanted to change that. James added just one small detail that really changed the whole photo! We guess that the digital artist likes to remind people that they are beautiful just the way they are. Of course, he does that with a lot of sarcasm, but this is why we love his work. 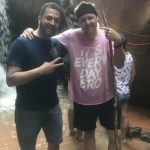 When this woman sent him a request, he decided to do what he does best! He did way more than she asked for, and turned her into a completely different person! The exaggeration was clearly a message for her. Trolling people requires a certain skillset. 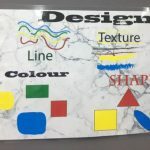 You need to be creative and you have to read between the lines! When you add a substantial amount of sense of humor, everything happens the way it should! 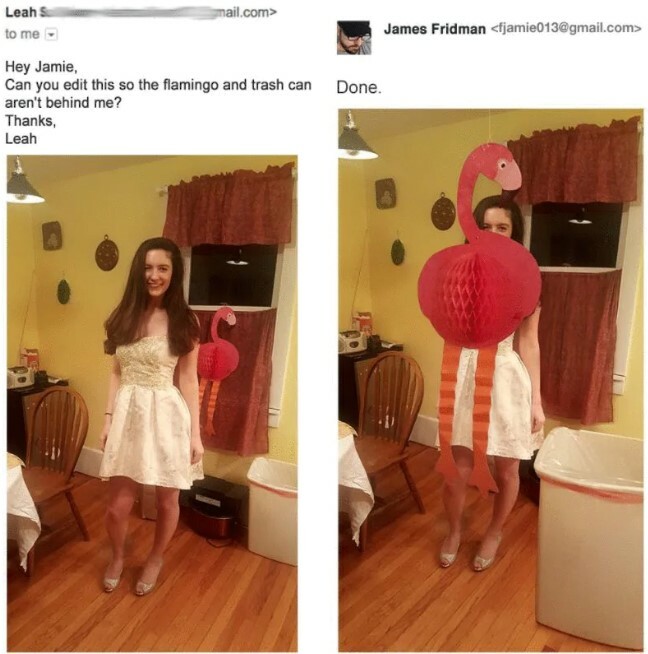 When this person wanted the flamingo and the trash can out of the photo, their request had to be a bit more specific. James took advantage of this and you can see the hilarious end result! We think that he still responded correctly and the two objects were no longer behind the person. We already mentioned that you need to be witty in order to troll people. 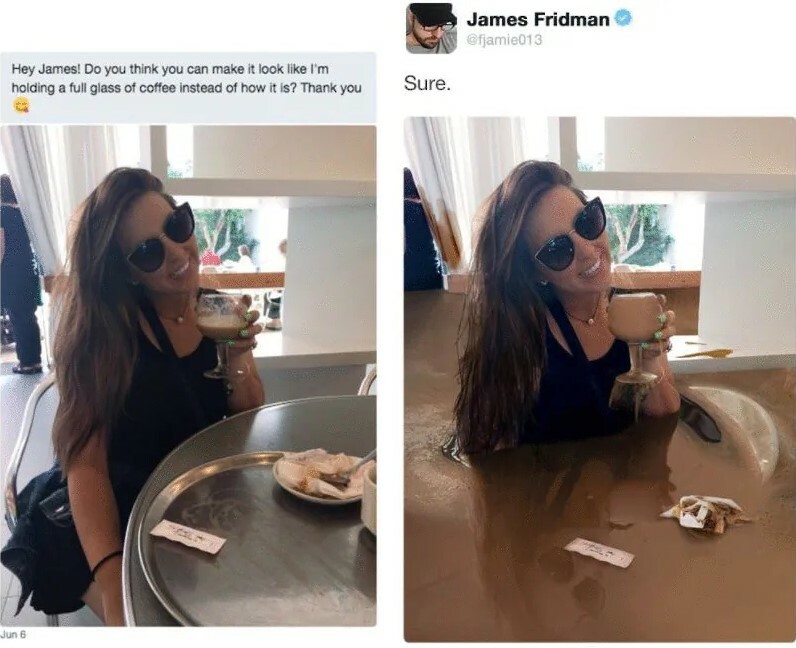 James Fridman is obviously that and a lot more! He is able to take advantage of every little detail of the photos or the requests that people send him. This funny photo is really clever as well! He realized that he could use the facial expression of the person on the right. By adding just a few small details he really transformed the whole composition! When creating this one, James really took the liberty to be creative. He did what this person asked him to do and her glass is now full. However, she probably did not expect to see herself literally swimming in a room flooded with coffee. The end result of James’ work looks absolutely ridiculous, and we like that he tends to go a little wild sometimes.